Singulair (Montelukast) is an allergy and asthma medication that is safe and effective for most individuals. Common Singulair side effects include mild flulike symptoms and sinus or upper respiratory infections. More serious side effects can include signs of depression, liver disease, Eosinophils and Systemic Vasculitis. This medication is formulated for adults and children alike. It should be noted that the children’s doses of Singular contain phenylalanine which may irritate those who are sensitive to aspartame. If these side effects are persistent or cause serious discomfort, you should contact your doctor to talk about other possible treatment options that may work better for you. Some patients experience an allergic reaction to this medication. If your symptoms include any of the following, you may be having a serious allergic reaction. This requires immediate medical attention. These side effects can be particularly uncomfortable. If they are persistent, consult with your doctor about changing medications. Never stop or lower the dosage of Singular abruptly on your own. Singulair side effects may also include liver damage, especially with long term use. If you are already suffering from liver disease, this could be particularly dangerous. In this instance it is best to avoid taking Singulair. All of the above are indications of depression and a dangerous mental state. Seek help immediately if these Singular side effects become apparent in yourself or someone you know. Side effects may occur if you are taking anticonvulsant medications. These types of drugs tend to make Singulair (montelukast) less effective so you should discuss this possibility with your doctor. Medications such as carbamazepine, oxcarbazepine, primidone, phenytoin, fosphenytoin, pentobarbital and Phenobarbital may all reduce the effectiveness of Singulair. Other medications that may cause a drug reaction are rifamycin antibiotics such as rifampin, rifabutin and rifapentine. Pregnant women may be able to take Singulair safely throughout their pregnancy. It is classified as Category B and thus considered to probably be safe during pregnancy. It is unknown whether Singulair passes through breast milk. Due to the inconclusive information in regards to Singular with pregnancy and breastfeeding, it is recommended that women speak with their doctor about their individual case in these situations. Eosinophils is an increase in white blood cells, and systemic vasculitis indicates an inflammation of the blood vessels. These conditions may be Singulair side effects. They occur most often in patients who have been taking a steroid medication. Signs of these Singulair side effects include rash, the feeling of pins and needles or numbness, inflammation and pain in the sinuses and flulike symptoms. If you experience these symptoms, contact your physician immediately. 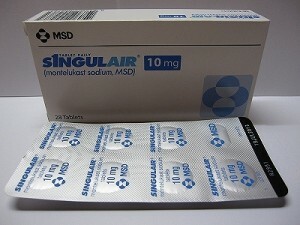 For most patients, Singulair (montelukast) will provide effective daily treatment of allergies or asthma. Its varied dosage options make it especially useful for young children who need relief from these symptoms. Singulair and montelukast have not been studied on patients who need treatment for both asthma and indoor/outdoor allergies at once, however. It is recommended that Singulair be used for only one of these issues at a time. Keep mindful of serious side effects, especially those pertaining to depression and suicide, whenever you are using a Singulair or montelukast medication regimen.